An introductory class designed for 3-4 year-olds. This program encourages young students to explore movement and musical rhythms with the help and security from a parent. Students are evaluated during this class for their readiness for the Pre-Primary program. Dress is comfortable clothing but has no uniform requirements. lore their imagination and creativity through dance. A ballet class designed for 6 & 7 year old students introducing classical ballet terminology, building posture and placement while continuing to develop basic loco motor skills and especially a love of dance. Students are encouraged to participate in optional Royal Academy of Dancing Examinations. This ballet class consists of both barre work and center practice emphasizing technique and musicality. Our goal is to instill an appreciation and discipline for the art. Students also are introduced to character dancing and can continue optional Royal Academy of Dancing Examinations. 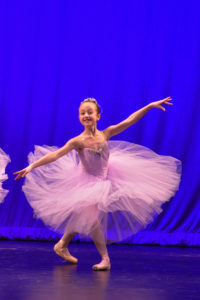 Students are encouraged to meet twice a week to ensure a steady and technically strong progression which eventually allows the student to start pointe technique at the end of Grade 4. This program is designed for the student age 10 and up with professional aspirations. Student receives intensive daily training in ballet, pointe, and contemporary. Students have opportunities to perform in many classical ballets including Swan Lake, Sleeping Beauty, Nutcracker, Don Quixote, and Coppelia. Students will have the unique opportunity to work with professional choreographers and guest arts enhancing their opportunities for scholarships and entrance to top arts schools and colleges. IPAC students have been accepted into some of the most prestigious training schools including Harid Conservatory, North Carolina School of the Arts, Kirov Academy, Dance Theatre of Harlem, School of the American Ballet and universities including Adelphi, Pointe Park, Towson and South Florida . IPAC students have won over $450,000 in scholarships.